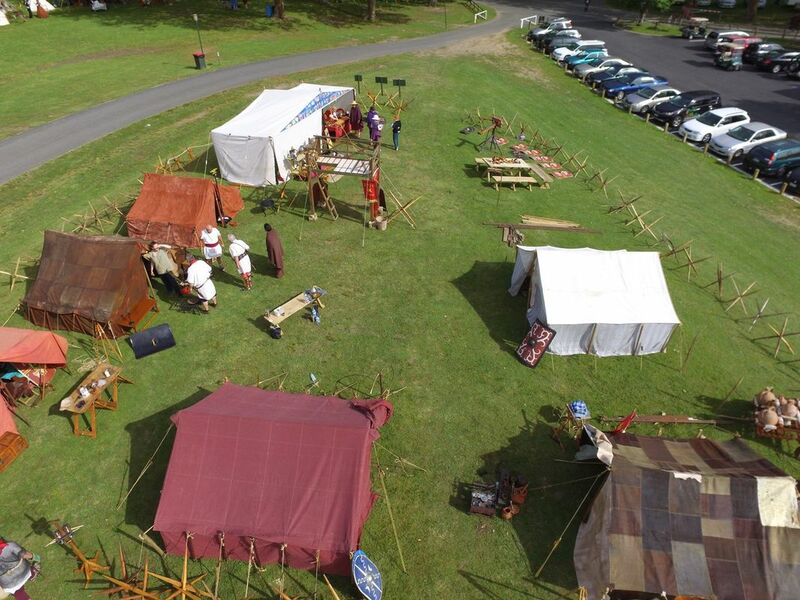 Leg VI Ferrata teamed up with Leg X Fretensis to build a Roman camp at Armistice Cambridge. We put on two gladiator shows for the bloodthirsty crowd to vote thumbs-up for life or thumbs-down for death, and two Roman shows fighting the auxiliaries of Wolpertinger, Northland Ancient Combat, and the Wulfing archers. We assisted in crowd control (as only Romans can) and ran kids' activities firing manuballistas. A fantastic weekend of bread and circuses. Nice video overview of our Roman show including parade, vallum, hero fights, melee and salute to Cambridge. Video highlights of the gladiator fights starring Mad Dog vs Speedy, Garricus of Syria vs Darius of Gaul, Nemo crupellarius vs Alcibiades hoplomachus, and Caesar vs Vercingetorix. Only one defeated fighter was awarded life by the baying mob.